Abstract: The hydrolytic activity from three partially purified family II pyrophosphatases from the photosynthetic bacteria Rhodobacter sphaeroides, Rhodobacter capsulatus, and Rhodovulum sulfidophilum, as well as the recombinant cytoplasmic pyrophosphatase from Rba. sphaeroides, was tested with Mg2+–PPi, Mn2+–PPi, and PPi4−. Unlike family I pyrophosphatases that hydrolyze only the Mg2+–PPi complex like those from Rhodospirillum rubrum, all family II enzymes tested showed hydrolytic activity with Mg2+–PPi, Mn2+–PPi, and PPi4− without cation. The activity without added cation remained the same, even under exhaustive dialysis or after desalting the enzyme through a Sephadex G-25 column. However, this activity disappeared upon the addition of ethylenediaminetetraacetic acid and could not be restored by adding Mg2+. Moreover, the enzyme inactivation was not related to dissociation into lower molecular subunits as in other family II enzymes. This is the first report on pyrophosphatases that can hydrolyze pyrophosphate without a divalent cation added and that presumably contain a tightly bound divalent cation in their structure. Soluble inorganic pyrophosphatases (EC 3.6.1.1; sPPase) are enzymes that specifically catalyze the rupture of pyrophosphate (PPi) into two molecules of orthophosphate (Pi). This reaction is essential for cell metabolism, as it provides thermodynamic pull for many biosynthetic reactions.1 Two families of sPPases (family I and family II), which are structurally different, genetically distant,2,3 and with similar catalytic mechanisms,4 have been found to date, and despite the great difference in sequence identity, both families have similar structures in the arrangement of their active site ligands and residues. In order to be able to hydrolyze, both sPPase families require divalent metal cations (M) that mediate the protein–PPi interactions.6 First, divalent cations form a complex that activates the enzyme (M–E), and then, divalent cations form a complex with pyrophosphate that forms the substrate (M–PPi). In family I sPPases, Mg2+ is preferred as the enzyme activator in contrast to family II, in which Mn2+ is preferred over Mg2+.7 It has been suggested that the pattern of catalysis for these enzymes is similar,5 and it consists of five steps: first, the formation of the activated complexes E–M and M–PPi; second, the binding of the substrate to the preformed enzyme-activated complex; third, isomerization of the resulting complex; fourth, breakdown of the phosphoanhydride bound by a water nucleophile, and finally, the dissociation of two Pi molecules. Despite that enzymes from both families share the same hydrolytic pattern, their functional properties are notably different. 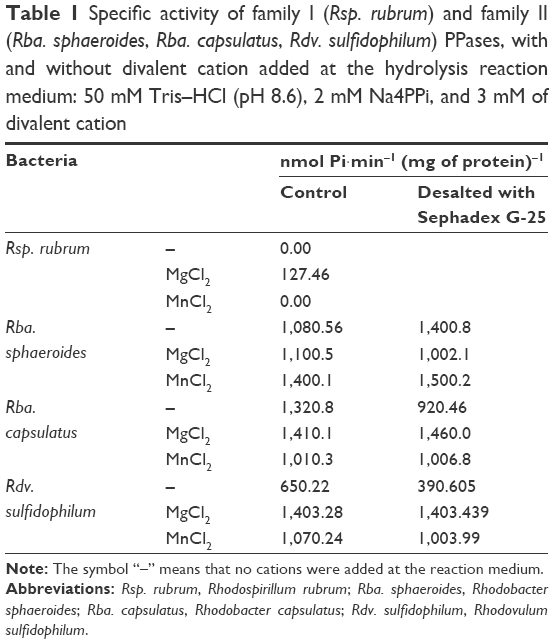 In this article, we report that family II pyrophosphatases from the photosynthetic bacteria Rhodobacter sphaeroides, Rhodobacter capsulatus, and Rhodovulum sulfidophilum can hydrolyze substrates that do not preform an M–PPi complex, but this is not the case for the Rhodospirillum rubrum family I pyrophosphatase that needs to preform an M–PPi complex in order to hydrolyze its substrate. The chemicals used in these experiments were purchased from Sigma-Aldrich Co. and J.T. Baker. All chemicals were of analytical grade or higher. The photosynthetic strains of Rba. sphaeroides 2.4.1, Rba. capsulatus DSM 1710, Rdv. sulfidophilum DSM 1374, and Rsp. rubrum ATCC 11170 were grown anaerobically, under a tungsten lamp of 40 W at 30 cm in the medium, which was previously described by Cohen-Bazire and Kunisawa.8 Once bacterial cultures were in the late exponential phase, the cells were harvested and washed with 50 mM 3-(N-morpholino) propanesulfonic acid and 50 mM KCl, pH 7.5. Liquid medium was removed by centrifugation, and the pellet obtained (wet weight) was stored at −80°C. The transformed Rosetta/pFSO/pPIRL strain was grown in an Luria-Bertani broth (LB) LB medium with antibiotics (100 μg ampicillin·mL−1 and 25 μg chloramphenicol·mL−1) at 37°C until the bacterial culture reached an OD600 of 0.6. Then, arabinose was added at 0.2% v/v final concentration. After 3 hours of incubation (37°C and shaken at 250 rpm), the cells were centrifuged at 5,524× g for 15 min, and the resulting pellet was resuspended in 50 mM Tris-HCl (pH 8.6), 10 mM MgCl2 (buffer A), and 10 mM imidazole. Later, the cells were lysed with 200 μg lysozyme·mL−1 for 30 min and were disrupted by sonication (Branson Sonifier 250) with an output of 40% (80 W) applying five pulses of 10 s. Then, they were centrifuged to remove cellular debris at 15,200× g for 20 min. The supernatant fraction was mixed with Ni-NTA beads (Quiagen NV) and placed into a polypropylene column. Then, the mixture was washed 15 times with buffer A plus 20 mM imidazole, and finally, the recombinant protein was eluted with buffer A plus 200 mM of imidazole. PPase assays were carried out at 37°C in a reaction medium containing 50 mM Tris–HCl (pH 8.6), 2 mM Na4PPi (pH 8.6), and 3 mM MgCl2 (modifications of these conditions are indicated in the figure legends). The reactions were initiated by adding the enzyme and arrested by the addition of trichloroacetic acid to a final concentration of 6% v/v. The hydrolyzed pyrophosphate was determined according to Sumner.12 Proteins were measured by the method of Lowry et al,13 using bovine serum albumin as a standard. All experiments were repeated at least three times. Note: The symbol “–” means that no cations were added at the reaction medium. Abbreviations: Rsp. rubrum, Rhodospirillum rubrum ;Rba. sphaeroides, Rhodobacter sphaeroides ;Rba. capsulatus, Rhodobacter capsulatus ;Rdv. sulfidophilum, Rhodovulum sulfidophilum. The amount of hydrolyzed pyrophosphate by the partially purified Rs-sPPase when divalent cations were not added to the reaction medium (1,080.56 nmol Pi−1·min−1 [mg of protein]−1) was equivalent to the amount obtained when Mg2+ was added (1,100.5 nmol Pi−1·min−1 [mg of protein]−1; Table 1); this suggests the existence of divalent cations bound to the enzyme that may form the metal–substrate complex. Based on the above assumption, another two partially purified family II pyrophosphatases from the photosynthetic bacteria Rba. capsulatus (Rc-PPase) and Rdv. sulfidophilum (Rv-PPase) were depleted from free cations desalting the enzymes three times through a Sephadex G-25 filtration column. Then, the hydrolytic activities of the enzymes were tested with and without metal cofactors (Table 1). Despite the lack of externally added free divalent cations, all FII pyrophosphatases tested (Rs-PPase, Rc-PPase, and Rv-PPase) can hydrolyze pyrophosphate. Moreover, we know that if a PPi–Mg complex is not formed, the protein–PPi interactions are not being replaced by monovalent cations from the complex Na4PPi; this is because the substrates K4PPi, Li4PPi, and Tris–PPi are hydrolyzed at the same rate (data not shown). Figure 1 EDTA effect on the hydrolysis of pyrophosphatase. Notes: Reaction conditions were 50 mM Tris–HCl (pH 8.6) and EDTA at the concentrations indicated on the abscissa. Different complexes were used as substrates: Mg–PPi (3 mM MgCl2 and 2 mM Na4PPi) in Rsp. rubrum (•) family I sPPase and PPi 2 mM without divalent cation added in Rba. capsulatus (◼), Rba. sphaeroides (⧫), and Rdv. sulfidophilum (▴) family II sPPases. For family I pyrophosphatase, 100% is equivalent to 127 nmol Pi·min−1 (mg of protein)−1, and for family II pyrophosphatases, 100% is equivalent to 1,240 nmol Pi·min−1 (mg of protein)−1. Abbreviations: EDTA, ethylenediaminetetraacetic acid; Rsp. rubrum, Rhodospirillum rubrum ;Rba. capsulatus, Rhodobacter capsulatus ;Rba. sphaeroides, Rhodobacter sphaeroides ;Rdv. sulfidophilum, Rhodovulum sulfidophilum. Figure 2 EDTA effect on the Rba. sphaeroides recombinant sPPiase activity. Notes: Black bars represent reactions with 3 mM MgCl2 added, and white bars represent reactions in which no divalent cation was added. 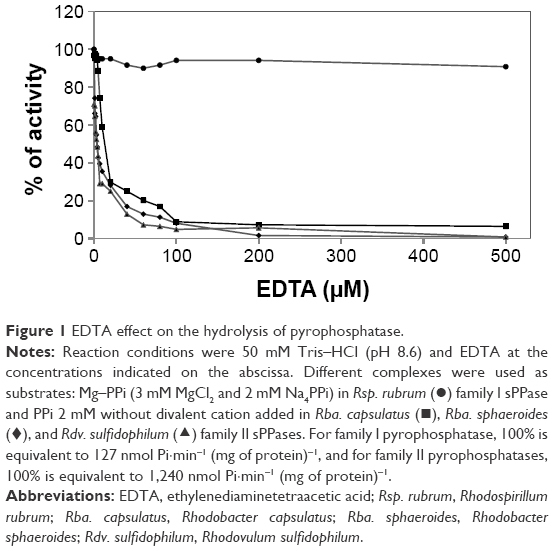 -EDTA represents hydrolysis reaction without EDTA. 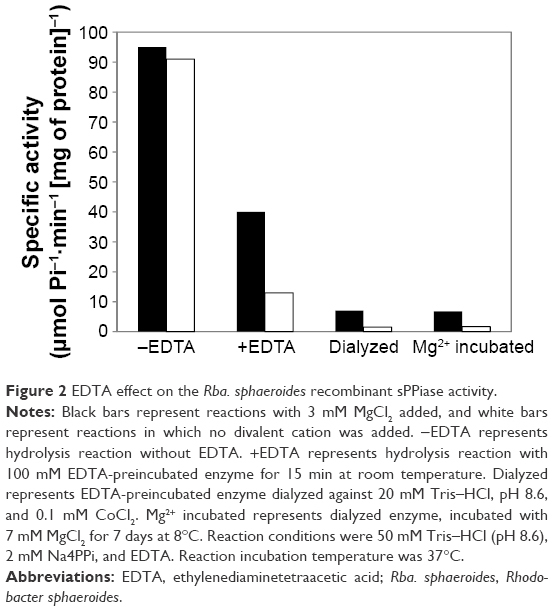 +EDTA represents hydrolysis reaction with 100 mM EDTA-preincubated enzyme for 15 min at room temperature. Dialyzed represents EDTA-preincubated enzyme dialyzed against 20 mM Tris–HCl, pH 8.6, and 0.1 mM CoCl2. Mg2+ incubated represents dialyzed enzyme, incubated with 7 mM MgCl2 for 7 days at 8°C. Reaction conditions were 50 mM Tris–HCl (pH 8.6), 2 mM Na4PPi, and EDTA. Reaction incubation temperature was 37°C. Abbreviations: EDTA, ethylenediaminetetraacetic acid; Rba. sphaeroides, Rhodobacter sphaeroides. However, regardless of the amount of EDTA added at the recombinant Rba. sphaeroides family II pyrophosphatase, the dissociation into lower molecular mass subunits does not occur (Figure 3), as judged by the native electrophoresis, suggesting that the quaternary integrity of the enzyme is maintained even after inactivation with EDTA and cation unavailability. Figure 3 Silver-stained native PAGE of the recombinant Rba. sphaeroides sPPase preincubated with different concentrations of EDTA. Abbreviations: PAGE, polyacrylamide gel electrophoresis; Rba. sphaeroides, Rhodobacter sphaeroides; EDTA, ethylenediaminetetraacetic acid. Finally, it is well known that EDTA chelates divalent cation and its use in reports in which the role of divalent cations is discussed are plenty. Since the first characterization of a family II enzyme from B. subtillis17 was stated that EDTA causes disruption of subunits and subsequently loss of activity, this is the case for another two family II pyrophosphatases mentioned earlier, S. gordonii and S. mutans, that shows the same behavior as B. subtillis, including the fact that inhibition caused by EDTA can be reverted. We do not have detailed mechanistic explanation about how the pyrophosphate is hydrolyzed without added divalent cations, why the quaternary structure of our enzyme is maintained in the presence of EDTA or why the loss of activity cannot be restored even with exhaustive dialysis and divalent cation supplied. Only solving the crystal structures of these enzymes with and without divalent cations may reveal if they can hydrolyze free pyrophosphate using a structural tightly bound cation that shields the charge from this highly electronegative molecule. What we already know is that another structural cation is also present in the photosynthetic bacterium family II pyrophosphatase from Rba. capsulatus;18 proton-induced X-ray emission analysis showed that three Co2+ ions are coupled in the enzyme, but no localization in the structure is determined. We think, based on non-published data, that Co2+ plays a protective role against chelation with EDTA, and this is why we are currently working on solving the crystal structures from this enzyme. Although the structure of family II pyrophosphatases differs greatly from that of family I, yet they catalyze the same hydrolysis reaction with apparently the same mechanism. However, unlike family I PPases, the Rba. sphaeroides family II PPase, as well as other photosynthetic bacterium pyrophosphatases belonging to the same family, can hydrolyze PPi presumably with a tightly bound divalent cation in its structure, without preforming a PPi–divalent cation substrate complex. Apparently, the tightly bound divalent cation from Rba. sphaeroides family II PPases is not related to the enzyme quaternary structure stability, since its dissociation into lower molecular subunits was not observed in the presence of EDTA, as in other non-photosynthetic bacterium family II pyrophosphatases. This work was supported by the IFC Molecular Genetics Department’s budget. We thank the Molecular Biology Unit of the IFC for sequencing facilities and for performing primer synthesis. We thank Diego Gonzalez Halphen and Miriam Vazquez Acevedo for their support with reagents and helpful advice and Fernando Suaste Olmos and José de Jesús García Trejo for their excellent technical help. Kornberg A. The participation of inorganic pyrophosphate in the reversible enzymatic synthesis of diphosphopyridine nucleotide. J Biol Chem. 1948;176(3):1475–1476. Shintani T, Uchiumi T, Yonezawa T, et al. Cloning and expression of a unique inorganic pyrophosphatase from Bacillus subtilis: evidence for a new family of enzymes. FEBS Lett. 1998;439(3):263–266. Young TW, Kuhn NJ, Wadeson A, Ward S, Burges D, Cooke GD. Bacillus subtilis ORF yybQ encodes a manganese-dependent inorganic pyrophosphatase with distinctive properties: the first of a new class of soluble pyrophosphatase? Microbiology. 1998;144(pt 9):2563–2571. Heikinheimo P, Lehtonen J, Baykov A, Lahti R, Cooperman BS, Goldman A. The structural basis for pyrophosphatase catalysis. Structure. 1996;4(12):1491–1508. Merckel MC, Fabrichniy IP, Salminen A, et al. Crystal structure of Streptococcus mutans pyrophosphatase: a new fold for an old mechanism. Structure. 2001;9(4):289–297. Heikinheimo P, Tuominen V, Ahonen AK, et al. Toward a quantum-mechanical description of metal-assisted phosphoryl transfer in pyrophosphatases. Proc Natl Acad Sci U S A. 2001;98(6):3121–3126. Fabrichniy IP, Lehtio L, Tammenkoski M, et al. A trimetal site and substrate distortion in a family II inorganic pyrophosphatase. J Biol Chem. 2007;282(2):1422–1431. Cohen-Bazire G, Kunisawa R. Some observations on the synthesis and function of the photosynthetic apparatus in Rhodospirillum rubrum. Proc Natl Acad Sci U S A. 1960;46(12):1543–1553. Romero I, García-Contreras R, Celis H. Rhodospirillum rubrum has a family I pyrophosphatase: purification, cloning, and sequencing. Arch Microbiol. 2003;179(5):377–380. Celis H, Franco B, Escobedo S, Romero I. Rhodobacter sphaeroides has a family II pyrophosphatase: comparison with other species of photosynthetic bacteria. Arc Microbiol. 2003;179(5):368–376. Suaste-Olmos F, Domenzian C, Mireles-Rodríguez JC, et al. The flagellar protein FliL is essential for swimming in Rhodobacter sphaeroides. J Bacteriol. 2010;23(23):6230–6239. Sumner JB. A method for the collorimetric determination of phosphorous. Science. 1944;100(2601):413–415. Lowry ON, Rosenbrough J, Farr AL, et al. Protein measurement with the follin phenol reagent. J Biol Chem. 1951;254:6528–6537. Bloom H, Beier H, Gross HS. 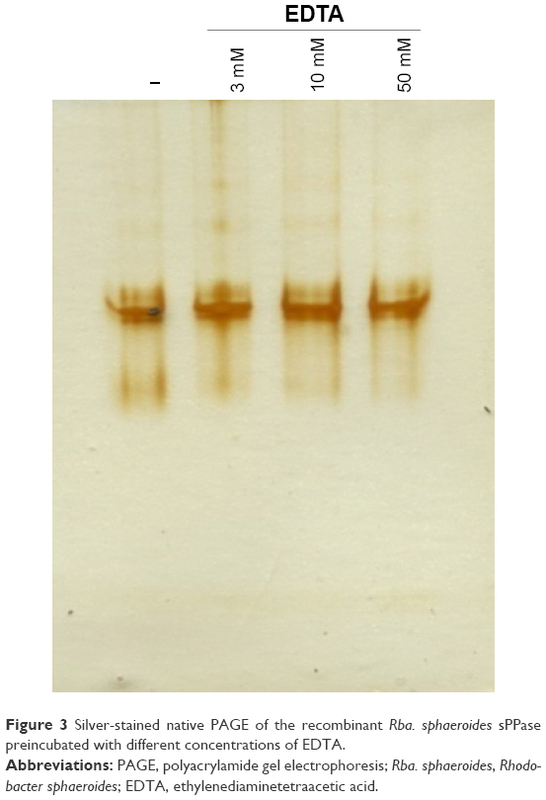 Improved silver staining of plant proteins, RNA and DNA in polyacrylamide gels. Electrophoresis. 1987;8:93–99. Parfenyev AN, Salminen A, Halonen P, Hachimori A, Baykov AA, Lahti R. Quaternary structure and metal ion requirement of family II pyrophosphatases from Bacillus subtilis, Streptococcus gordonii, and Streptococcus mutans. J Biol Chem. 2001;276(27):24514–24518. Kuhn NJ, Ward S. Purification, properties, and multiple forms of a manganese-activated inorganic pyrophosphatase from Bacillus subtilis. Arch Biochem Biophys. 1998;354(1):47–56. Solís C, Celis H, Romero I, et al. Metal/protein ratio determination in the Rhodobacter capsulatus cytoplasmic pyrophosphatase enzyme by particle induced X-ray emission. J Microbiol Methods. 2011;84(2):272–277.